A trusted solution for importing PST to Office 365 online mailbox easily. Office 365 Import PST tool migrate Outlook emails, contacts, calendar and tasks to Exchange Online account quickly. Incremental option of Office 365 Import PST tool is an option that provides user to migrate only those data items that are new or have abruptly stop in the previous PST to O365 migration process. 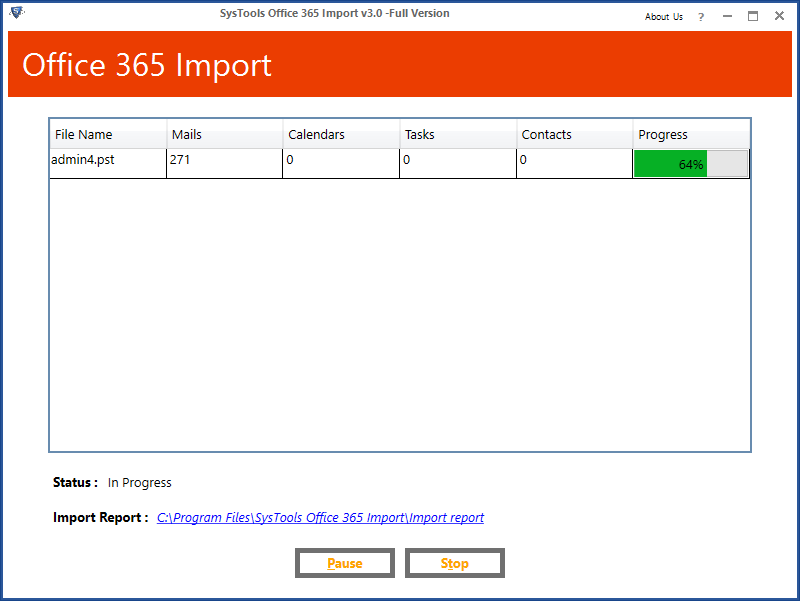 Through this feature of Office 365 PST Import tool user save a lot of time and effort. 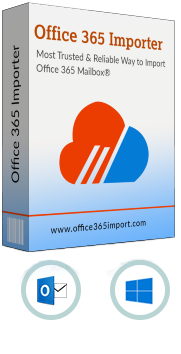 "Office 365 Import tool is perfect tool to import multiple PST file into Office 365. I personally used this software and recommends to those who don't want to use manual Network upload and Drive shipping methods to migrate PST to Office 365." "Ferramenta perfeita para importar o PST para o Office 365." Office 365 Import tool understand the pain which users goes through while manually trying to import PST into Office 365 mailbox account. Therefore, here is an application named as Microsoft Office 365 mailbox migration that is purposely designed only to easily import Outlook emails to Office 365 with certain other data items like contacts, tasks, and calendar. 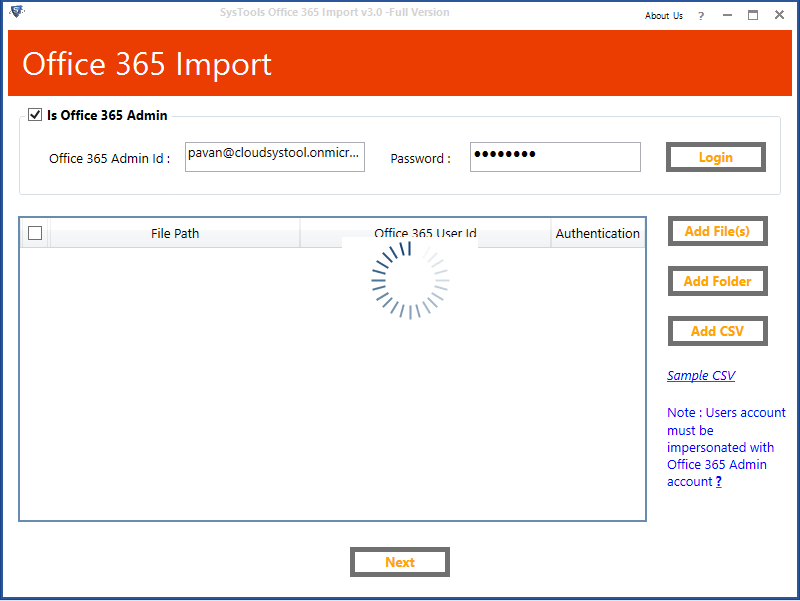 The Office 365 Import tool works in a way that the things are in same form as they were in previous manner. 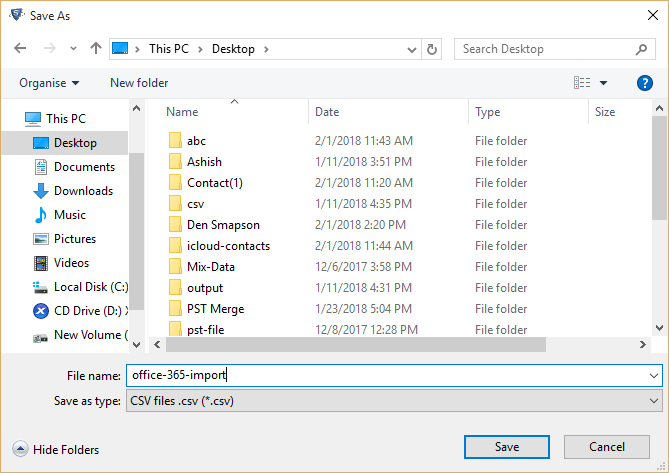 The Office 365 PST migration tool provides an additional option to import PST to Office 365 by creating a folder with username and then, add PST folders within it. This measure also keeps data formatting and styling in exact manner as in Microsoft Outlook. As user can import Outlook PST file to Office 365 via this techniques and can saves a lot of time and effort. In other words it is also a unique Azure Azcopy alternative available to migrate Outlook mailbox to Office 365 cloud. Category Based Migration: Tick the checkbox in Office 365 PST import tool to selects particular data like emails, contacts, calendars and tasks. Date-based Migration: Filters only the data with in the date range mentioned by the customers and import emails from PST to Office 365 easily. The greatest benefit of using Office 365 Import tool is that it provides an option to migrate Outlook PST files from Network to O365. This unique feature will allow the user to import PST files to Office 365 account if those files are in local network. Migrating PST files to Office 365 becomes very fast and convenient. Migrate Outlook emails to Office 365 is not imposed with any restriction of file size, which users need to keep in mind while working with it. No matter what is the size of PST file, you would easily be able to import PST files to Office 365 targeted account without any restriction. 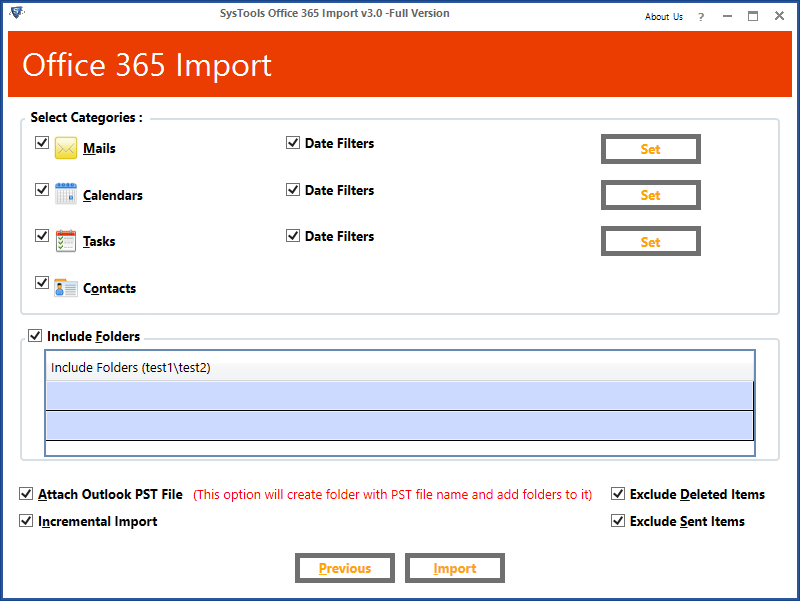 The best part to import multiple PST files into Office 365 via O365 PST migration tool is that it supports transferring of bulk folders simultaneously all in one cycle. Office 365 PST Import tool is made in such an effective way that it follows the incremental import approach. 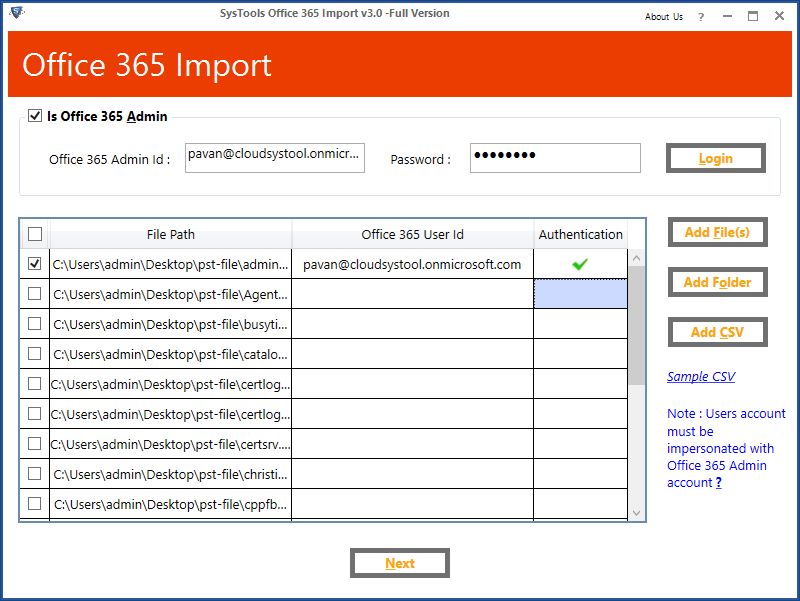 With this option of Office 365 PST migration tool, importing PST to Office 365 becomes easy. This means if any client has already migrated Outlook emails to Office 365 once, then in next attempts, the tool will only imported data that is not presents. Migrating PST files to Office 365 through incremental option helps user to get rid of duplicates emails. 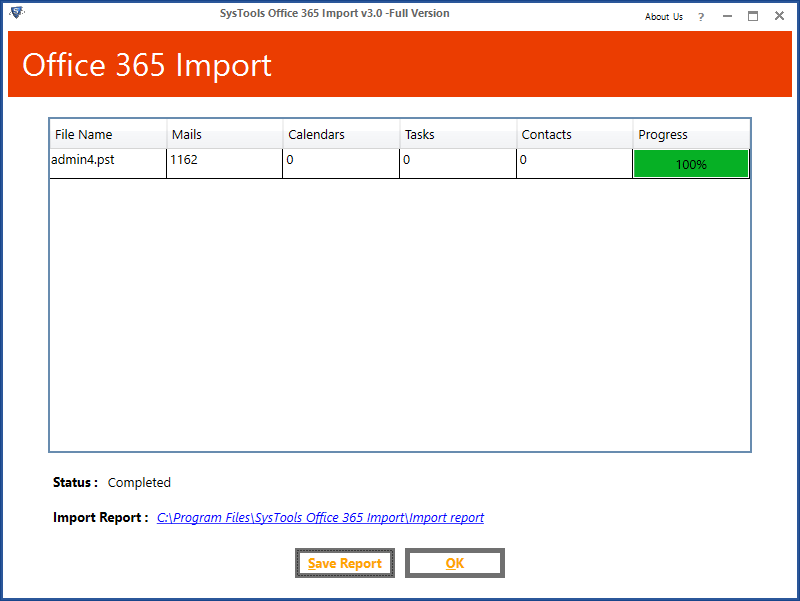 This Office 365 import tool provides the current process report when PST migration to Office 365 procedure gets started. Through this application, end users will now be capable to notice the entire report of import PST file to Office 365 mailbox. 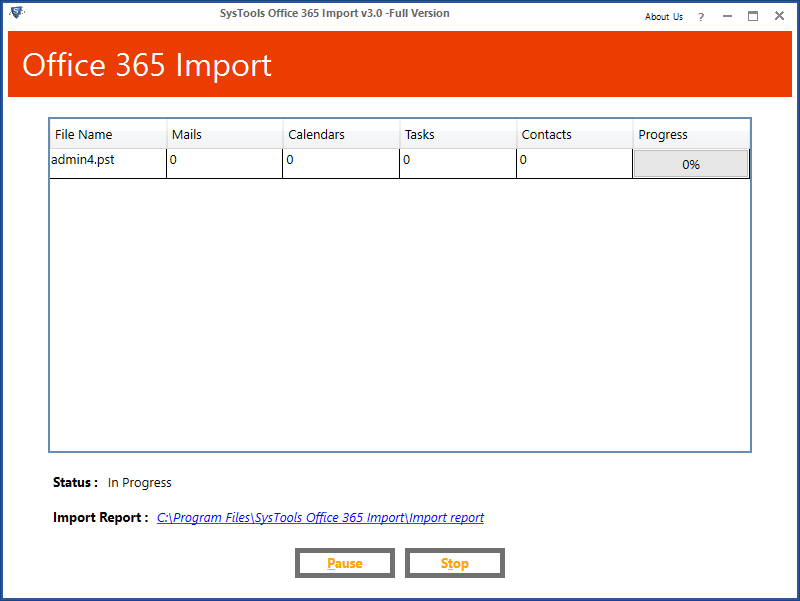 This Office 365 PST migration tool generates a fully functional report that tells what are data is imported to Office 365 and what all tasks have failed. 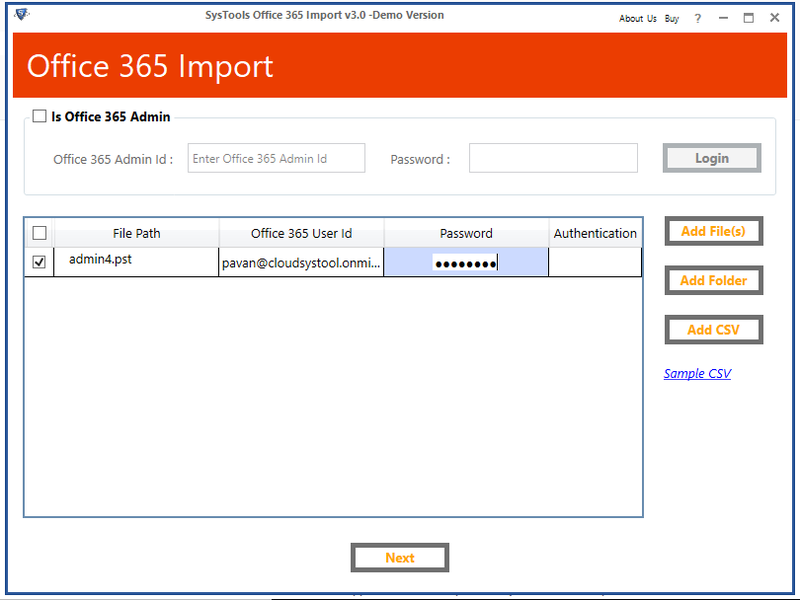 In nutshell the user will receive a detailed report of the process to import PST to Office 365 online. 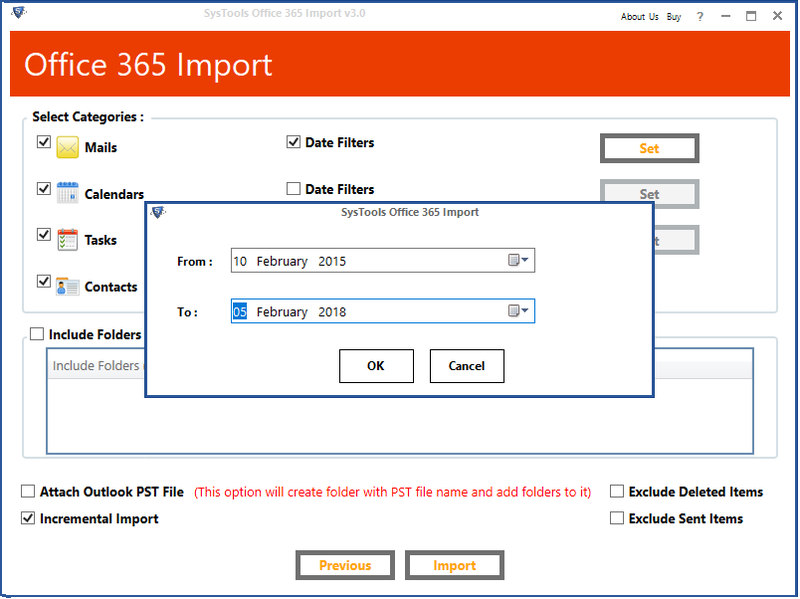 This pause and resume feature of Office 365 Mailbox Import tool is one of the smartest way to save time while importing PST to Office 365 mailbox. The processing of the application can be paused in between, if something goes wrong in the process to import emails from Outlook to Office 365. This feature is useful in case when the internet bandwidth is needed for some other tasks. The process of Resume get only active when the particular thread is properly imported to the destination in Office 365. User will be able to resume conversion procedure from the exact point where it had left. Demo version of Office 365 Import Tool moves only first 25 data items per folder from Outlook emails to Office 365. 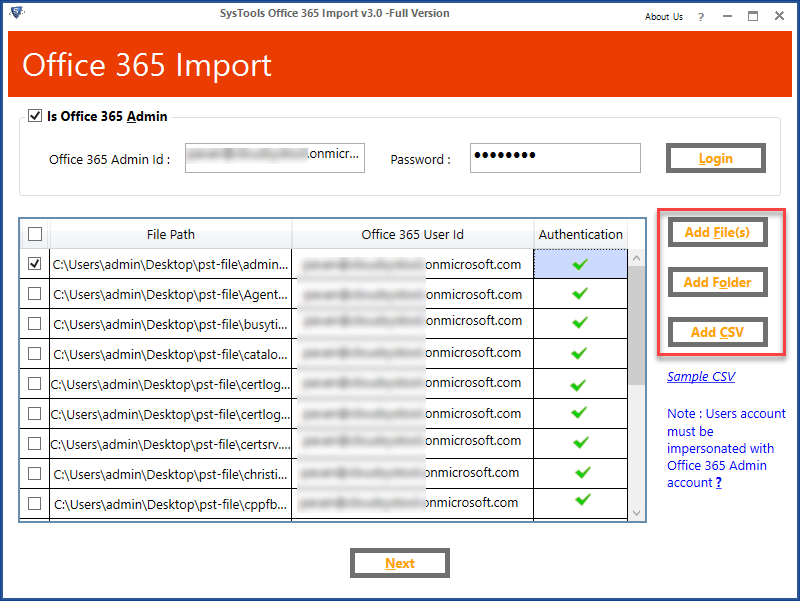 Check to the "Is Office 365 Admin" option to import PST into Exchange Online and provide the credentials for the admin account and click on the "Login" button. Then click on the Add Files or Folder option as needed. After clicking on Add files button you are navigated where you need to select PST files from the browse window and click on the "Open" button. You can even add the the entire folder as stated above. Click on the Add folder button to import Outlook PST to Office 365. Navigate and select folder containing PST files and click on the "OK" button. 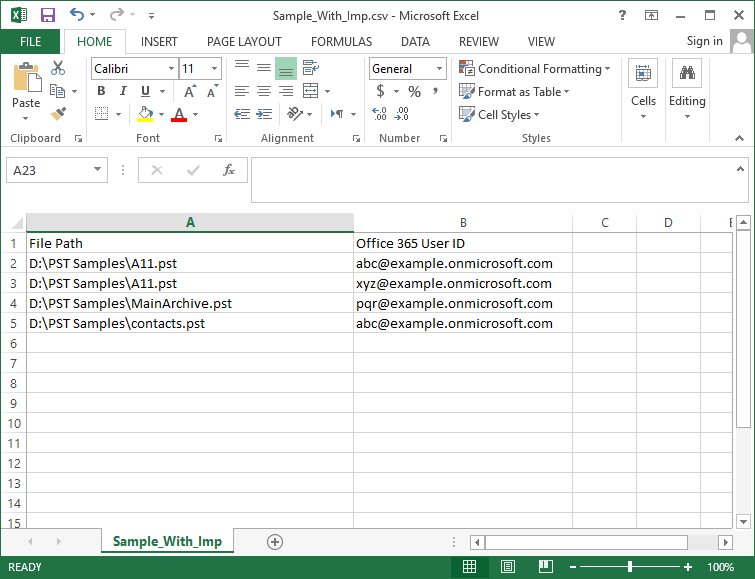 A CSV file can also be added to the Office 365 Import software by using the "Add CSV" button, You can click on the Sample CSV button in order to view the CSV file format. The format is like this. Now, Provide the domain id credentials for which the PST file is to be imported and then authenticate them. After that Click on Next to import Outlook emails to Office 365 cloud mailbox. Click on the the checkbox corresponding to the "Mails" checkbox and also select the checkboxes corresponding to the "Date filters" button or "Calendar" checkbox accordingly. Click on the the checkbox corresponding to the "Include Folders" checkbox. 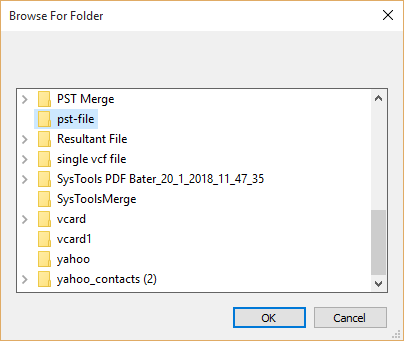 Check the "Attach Outlook PST file" checkbox, As it enables the user to create folder with the PST file name and add folders to it. Check the "Incremental import" checkbox. It enables the user to start the migration process from where the migration process was at halt. Check mark the checkboxes to "Exclude Deleted Items" and "Exclude Sent items". 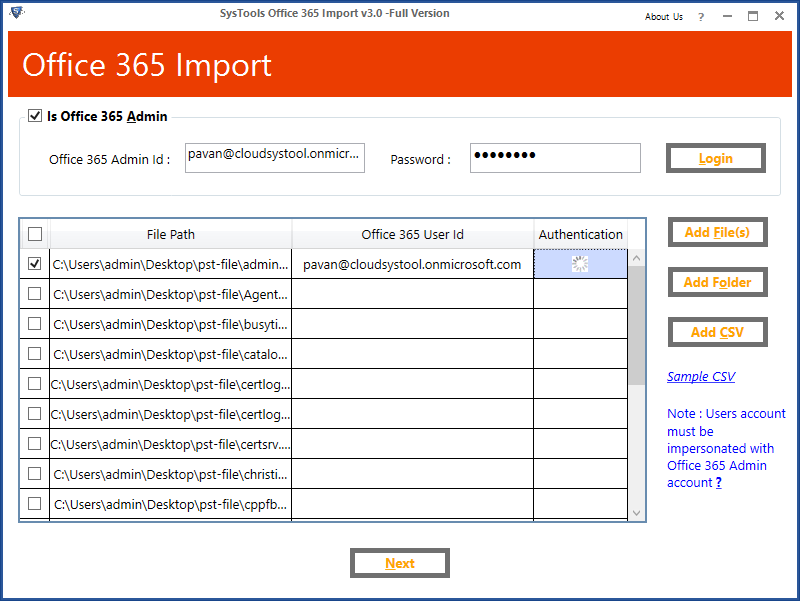 Press the "Import" Button and start the process to import PST file to Office 365 mailbox account. The Office 365 PST Migration software will now start the process to import PST to Exchange Online mailbox. Click on the "Save Report" button after you import PST to Office 365 account if needed. Report will be saved successfully. 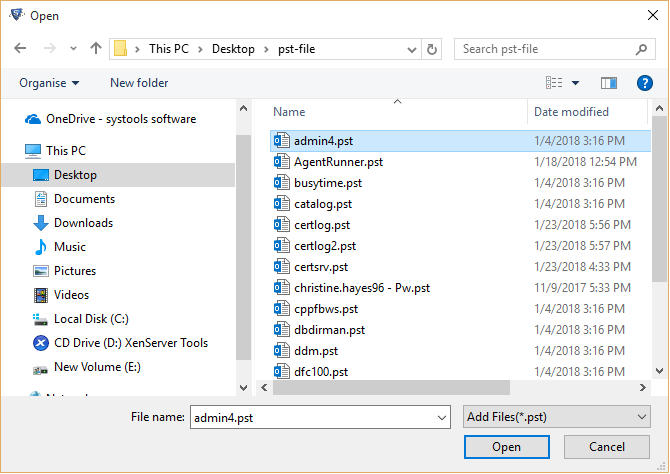 Add the PST files or entire Folder to Office 365 PST import tool. You can even add CSV files containing the PST details to import Outlook PST to Office 365. You can see the same CSV within the tool. Proceed with adding credentials to the list of PST files that are to be listed on the software and Click Next for moving Outlook PST file to O365. Click on the checkbox corresponding to the "Mails" checkbox or "Calendars / Tasks" checkbox and also select the check boxes corresponding to the "Date filters" button. Check "Attach Outlook PST file" checkbox, As it enables user to create folder with the PST file name and add folders to it. Check the "Incremental import" checkbox. It enables user to start the migration process from where the migration process was at halt. Check mark the checkboxes to "Exclude Deleted Items" and "Exclude Sent items"
The software will now start the process to import PST file to Office 365 Online mailbox. Click on "Save Report" button. Import PST to Exchange Online mailbox process completed successfully. Now import Outlook emails, calendar, contacts & tasks to Office 365 account rapidly. Get fast with the help of the below Screenshots. This is the best application to import PST into Office 365 account. 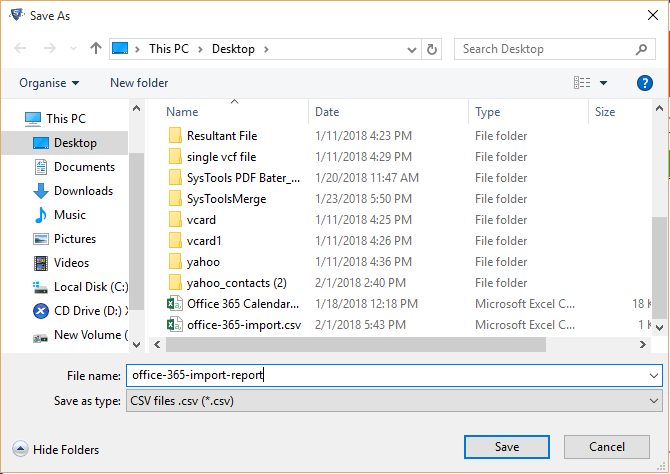 I have used this Office 365 Import tool to upload a PST file of 19GB size with different folders and subfolders within it to Office 365 account. All things were carried away in a seamless manner through this Office 365 PST Import Tool. And feeling as if nothing complicated was going on to migrate Outlook PST to Office 365 webmail. I had never imagined that migrating Outlook emails to Office 365 could ever be an easy task like this. I wished to migrate all of my old MS Outlook PST files to Office 365 account. This software helped me to import multiple PST files to Office 365 in a trouble-free manner. 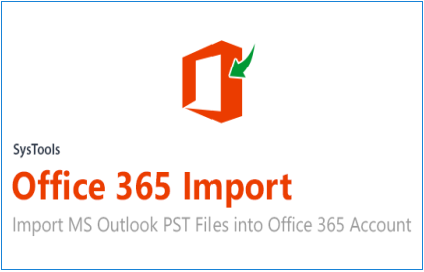 A big thanks to Office 365 Import's developers for creating a tool that helped me importing PST to Office 365! For months back, I was looking for the best and trust Azure Azcopy alternative to migrate Outlook mailbox to Office 365 account. I needed to import Outlook emails into Office 365 OWA and move all attachment to OWA. Then, I came across this tool & I must say that I am very much impressed with the way this application made my job effortless and smooth! I was able to import Outlook 2003 PST file to Office 365 cloud, unlike other tool that wasn't able to get my Outlook 2003 emails. The Office 365 Import PST tool is a perfect solution to upload PST file to Office 365 platform. The tool help me to migrate Outlook 2010 calendar to Office 365 so easily. Now I can proudly say that no other program performs the functionality as this tool does to migrate Outlook emails, contacts and calendar to Office 365 easily. Earlier to import Outlook 2010 to Office 365 was a tough task for me earlier but now each and every thing is clear and simple. Thanks for helping me to import Outlook PST to Office 365 so easily! Question: How to import Outlook PST file into Office 365 Account? I was going through the web I came to know this tool is an alternative of Azure Azcopy. I want to know the steps to transfer Outlook emails to Outlook.com. 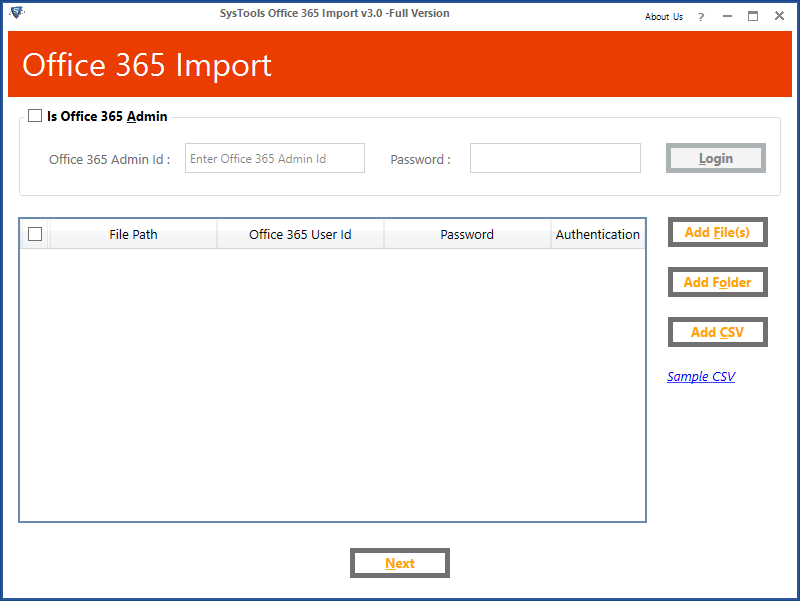 Install the Office 365 Import Tool. Check the option if you have the admin account. Now Add the Files or Folder containing the PST file. 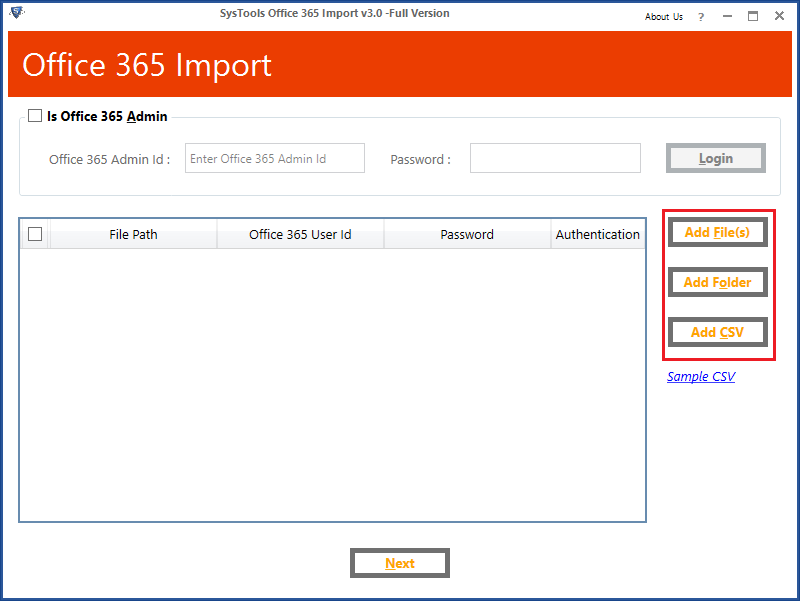 Authenticate the Office 365 Account and press Next button. Add the Filter and click on Import button. Wait for the tool and Outlook PST files will be migrated to Office 365. Click on Generate CSV if needed and you have successfully migrate PST to Office 365 account. Office 365 Import PST tool has now migrate Outlook emails, contacts, calendar and tasks to Office 365 account. Question: Does Office 365 PST migration tool import MS Outlook 2007 PST File into O365 Home premium account? Recently, I have purchased an Office 365 home premium and want to import MS Outlook 2007 PST file in this new account. Googling all over but for Azure Azcopy alternative, could not find any solution migrate Outlook 2007 to Office 365. If I don’t bring my email folders forward then, it will result me in closing of Office 365 account. Also, I am not having the Exchange server with me. Can anyone provide me a small hope to this, if there is any scope? Solution: Yes, you can use Office 365 Import PST Tool to import Outlook 2007 to Office 365 home premium account. For this, you just need to provide valid credentials for this task accomplishment. Question: Where will your Office 365 Import utility store my Office 365 business credentials, which I will be sharing for importing purpose? I am very much curious regarding my Office 365 account ids and passwords. But unfortunately, I have to share them with your software to import PST into Office 365 account. Seriously, I have putted stone on my heart and got ready to share my credentials with your tool to migrate PST file to Office 365. Before that, I want know from you guys that where will your PST to Office 365 migration would store them when I will be entering it in the tool UI? Solution: No where, in order to import PST file into Office 365 mailbox via software we take care of the security and data of each Outlook account. The Office 365 import PST software does not saves your credentials in any secretive database. The credentials are only required to learn if targeted O365 account where data is to be imported is correct or not. It just migrate local PST to Office 365 mailbox after successfully getting the credentials. Question:What does incremental import option do in this tool? I came to know that Office 365 Import tool is one of the best Azure Azcopy alternative in the market but actually I didn't understand what is incremental import option in your tool. Solution:Yes, Office 365 Mailbox Import Tool is one of the best alternative of Azure Azcopy. 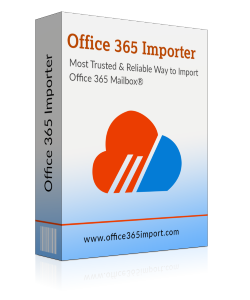 This Office 365 import PST tool has a features of Incremental Import through which you can import Outlook emails to Office 365 cloud in an effective manner. If the user is moving data for the second time from the same file then this Office 365 PST Import tool will only transfer the data that is new or not present in the destination location. Office 365 import PST tool would help each and every user to upload PST to Office 36 without Outlook. Question: Can I import PST file to multiple Office 365 user accounts of a single domain? Being an administrator of Office 365 account, I need to import PST file into Office 365 all user accounts, which are associated with admin. Around 100 accounts are under me and migrating PST file one-by-one in each account is hassle task. I can't afford this one-by-one data uploading technique. After learning my requirements to migrate Outlook PST to Office 365, do you think that Office 365 import services of your software is of any need for me? Solution: Yes, our tool features Administrator impersonation. You can share your admin account credentials for this task and then move a single PST file content to all user accounts all in one cycle. To import Outlook 2007 to Office 365 or any other Outlook version user can get this Office 365 Import tool. Question: Does your Office 365 PST Import tool migrate Outlook emails to Office 365 with their attachments also? Solution: Yes, Office 365 import PST tool works in a way that it will be moving messages with their respective attachments also. It will not discard the messages having attachments to import multiple PST file to Office 365 and move them in Office 365 account. Question: Can you give me some of the checklist before I import Outlook emails to Office 365 mailbox? I am thinking to migrate Outlook 2010 to Office 365 cloud account but before I migrate emails to Office 365 account, I want to know that are some of the checklist that I need to verify and keep in mind. Office 365 import PST without duplicates is even my concern that is hindering me to migrate Outlook emails and other data items into Office 365 Online. Solution: First of all we would tell you that you don't have to worry about the duplicate data items. While importing Outlook PST to Office 365, this tool make sure that PST data is already available or not. The unique incremental import option of this Office 365 Import service would make sure that if you are moving data for the second time, the already move data would be skipped. Now coming on the checklist that you need to create before you use this Microsoft Office 365 PST import tool is: Pre Office 365 Import PST Checklist. Calculate the size of PST data items that you need to move to Office 365 account. Make sure that same volume of data is uploaded from .pst to Office 365. Create a list of all important mails. All the attachment that are important for you should be downloaded in case you loss them. Check for Contacts and other calendar events. Check for the folders and sub-folder if they contains some import mail.